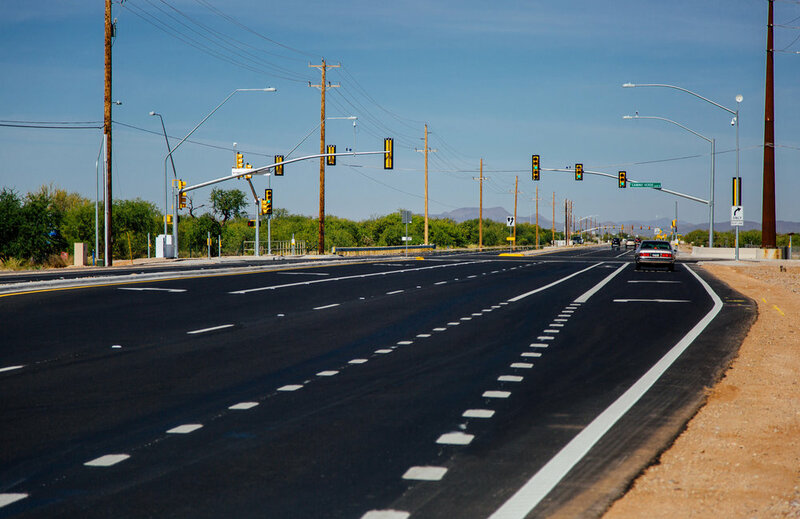 This award-winning, federally-funded project consisted of widening Valencia Road (2.5 miles of roadway and three intersections) in order to improve safety, reduce congestion, improve operations, and increase mobility. The project not only included roadway widening but also significant drainage improvements. The final scope of work consisted of constructing a four lane arterial roadway with a raised median along the Valencia Road alignment from Star Diamond Place (west boundary of the project approximately 1,800 feet west of Wade Road) to Camino Rancho and a five lane arterial roadway from Camino Rancho to the east boundary of the project (approximately 1,600 feet west of Mark Road). This project included importing more than 100,000 cubic yards of material to raise the roadway between one and four feet and installing six cast-in-place concrete box culverts to control and direct water flow in the Black Wash Floodplain. In addition to residents and commuters, Casino Del Sol Resort was a major project stakeholder. Achen-Gardner coordinated with Casino representatives and kept their main entrance accessible at all times. Also, as part of this project, the main Casino entrance was enhanced with a new signalized intersection and the branding of Casino Del Sol Drive. In total, the project included 125,000 SY of pavement, 30,654 SF of concrete flatwork, and 2,949 LF of pipe (925 LF of 18"-48" corrugated metal pipe for storm drain and 2,024 LF of 6"-12" ductile iron pipe for potable water).